Mt. 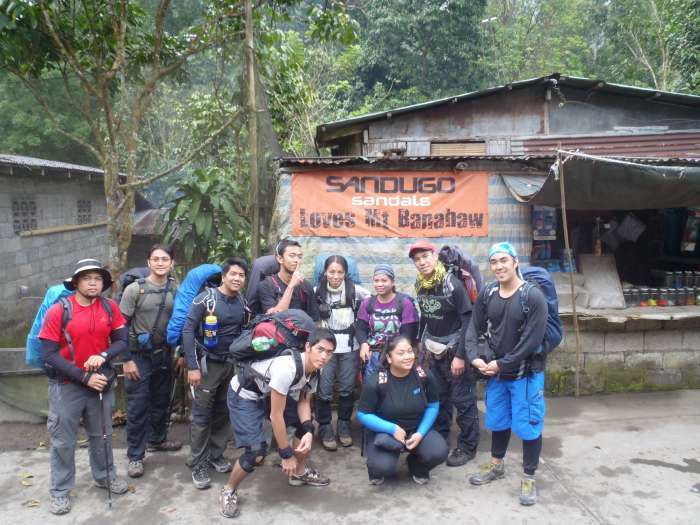 Banahaw, is a sacred mountain. Our climb was Mt. 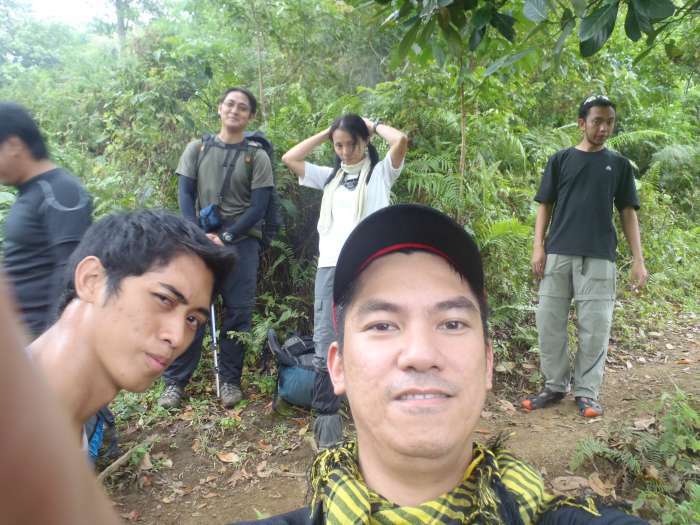 Banahaw Clean-up climb. It was an activity prepared by Al Del Barrio of Voyagers Adventure Club (VAC). 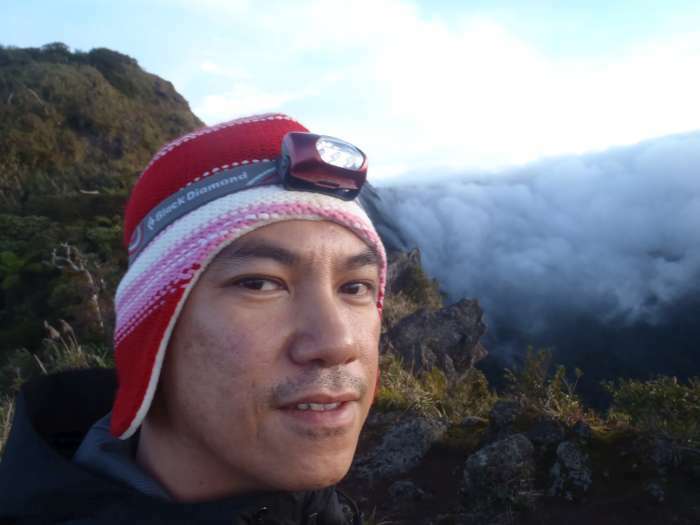 The itinerary is to start from Kinabuhayan, Dolores, then go through the “Tatlong tangke” trail to “Dungaw 1″ then back down via the “Cristalino” trail back to Kinabuhayan, Dolores. 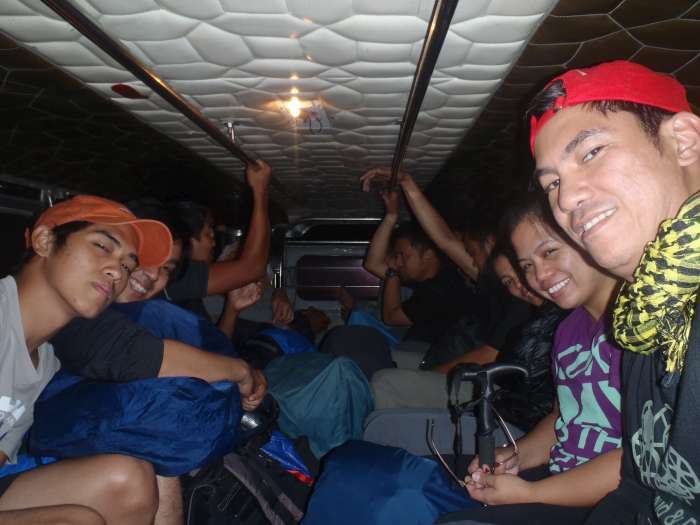 Meet up was at KFC in Buendia at 8PM, then commute by bus going to San Pablo, then by a jeep going to Dolores. We did not climb right away, but first stayed somewhere to take a nap. In the morning prior to start trek, we visited this place to light up candles and offer our prayers. 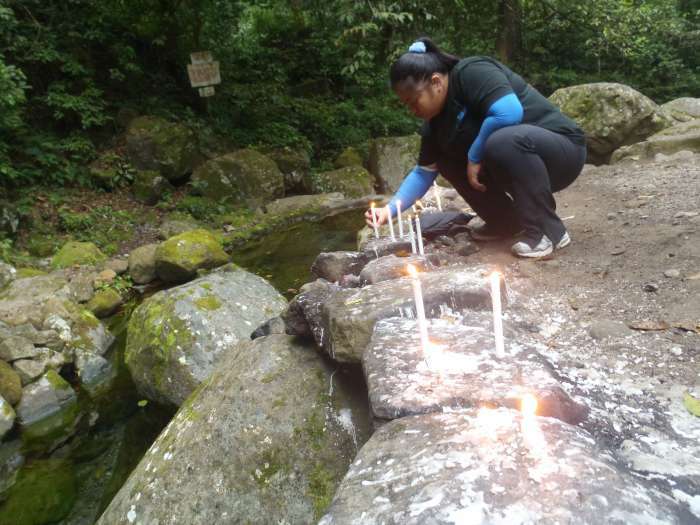 Actually, this stream is a shrine, which is why you can light up candles here. The water is potable and it is clearly a true mineral water. At the area near the stream, there is this big rock, it is said that Jesus marked his footprint here. Which is why this place is also considered a shrine. Roll call: In the group we have from L-R: Phil Handang, Julius Estrada, John Otico, Ken Ybarola, Miho Hazama, Agnes Robel, Myself, Eugene Rosete , Emj Babaran, Pia Bautista. Where’s Al? Al wasn’t able to join this climb. 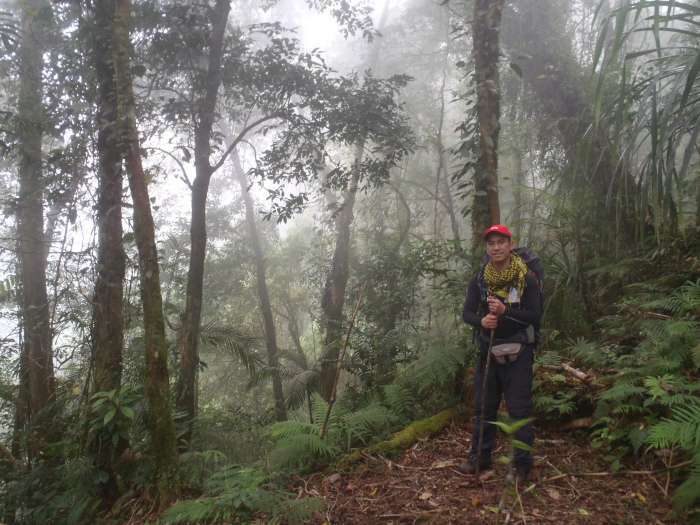 The trail going to “Tatlong tangke” is through farms, then there is this consistent upward trail going there. There is not much attraction on the trail but you can appreciate a really good view of Mt. Cristobal. Upon reaching “Tatlong Tangke” actually this is considered as a shrine too. We took some rest here to recover our energy due to the challenging trail, and we need energy to manage the more challenging trail ahead of us. 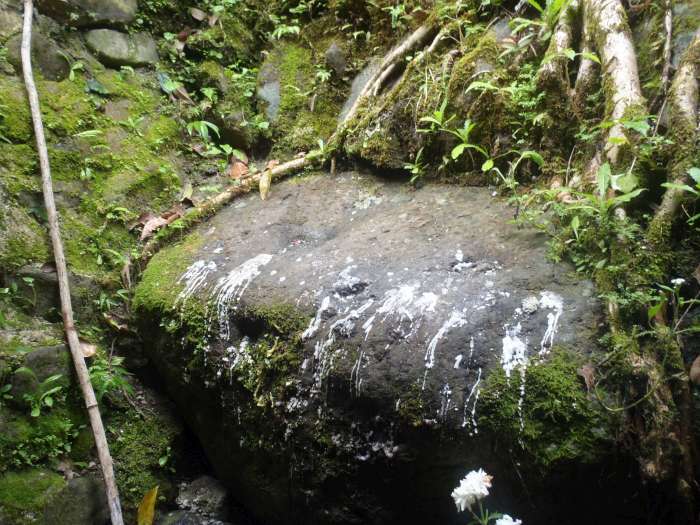 The “Tatlong Tangke” is a water source, there are pipes coming from here going downwards. There is also ample space near here for camping, maybe up to 4 tents max. 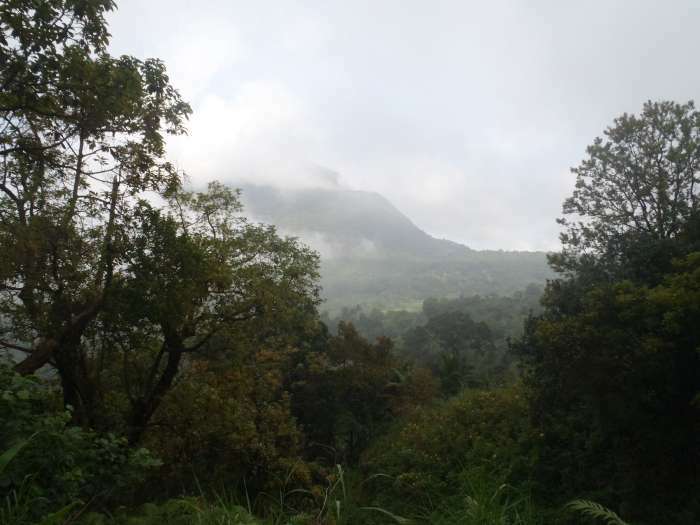 The altitude seems high now as the trails are becoming misty, the forest is now mossy here. It is not really that “patag” (flat) here. But it’s flat enough. The cross here would mean that this place too also is considered as a shrine. We had some rest here, a very long one, I guess. Some took their power naps. 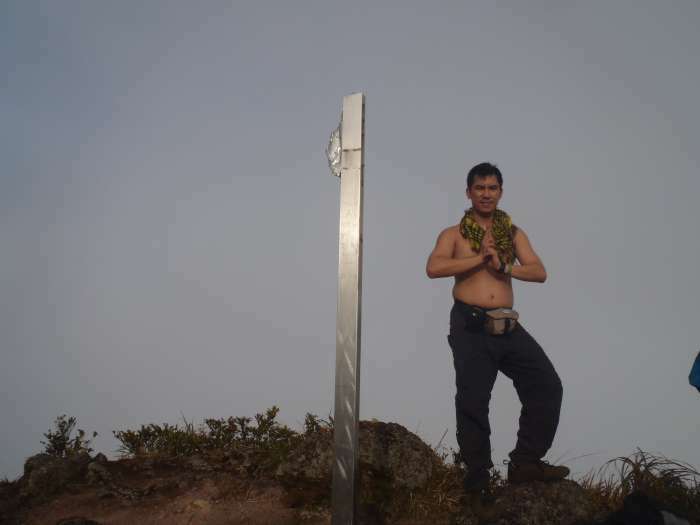 Soon we reached the summit “Dungaw 1″ (1st peak). This place is also considered a shrine. The metal piece is the only surviving part of a cross that once stood here. “Do not stay too close to the edge!” our guide would remind us. He told of an unbelievable story, that some people who went up here and who are full of themselves are not left unpunished. Some say the “spirits” would make their load very heave and unbearable even if it’s light. And some would say the “spirits” would reward you if you are kindhearted and humble, making your loads lighter as they help you with it. There is also a story that a couple, who have no respect for this place made love to each other, and by a force of wind, drove them to the edge and caused their deaths. There was also this story that a young man who also failed to give respect for the place and challenged the spirits because he do not believe such things, when he reached this very summit, it suddenly became “flooded” to his ankle. With such experience he fell to his knees and asked for forgiveness, and suddenly the flood subsided. Some folklore also links Mt. 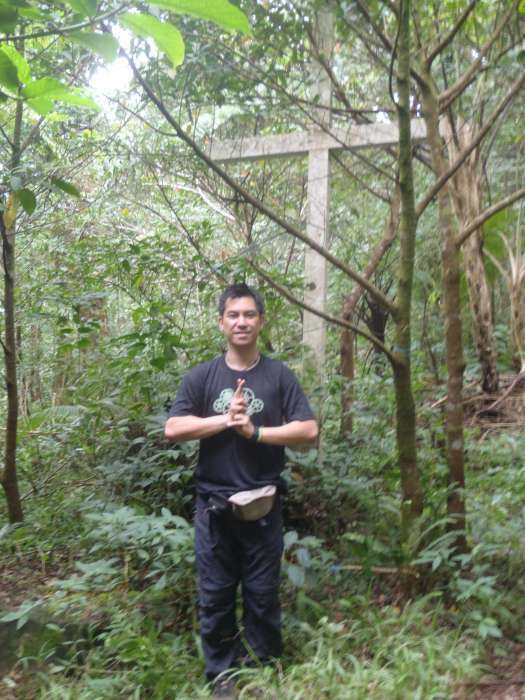 Banahaw to Mt. Makiling and Mt. Arayat, being the eldest of the three “Diwata” (Fairy) sisters. 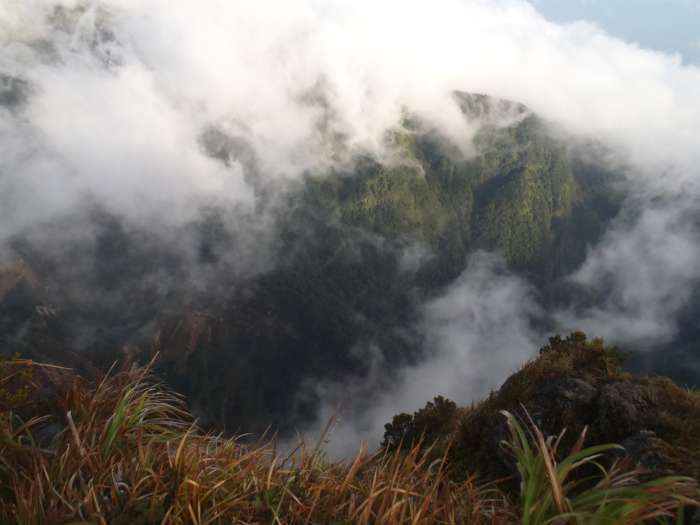 They are called Mariang Banahaw, Mariang Makiling & Mariang Sinukuan. It will be dark soon, so I chose a place to pitch my tent. Interestingly, the camping sites here are isolated and it is less likely that two tents will stay in one place. What do you think? Maybe it’s the terrain. The night was so cold. The winds are strong. I had a hard time getting sleep because I’m always thinking of the unseen things. No, maybe it’s that flapping fly sheet that kept me awake. The morning was filled with silence, and peace. There’s a lot of interesting places later. 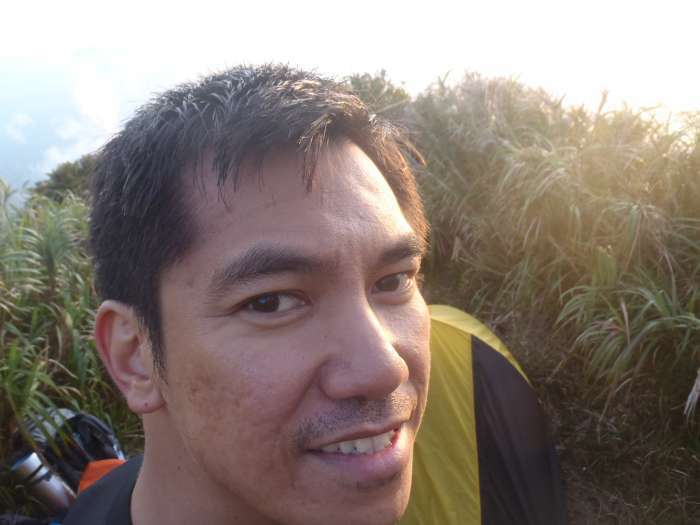 This entry was posted in Climb Log, Mountain, Mountaineer, Travel and tagged banahaw, climber, Diwata, Dolores, dungaw 1, durungawan, Maria Makiling, Mount Banahaw, Mount Makiling, mountain, mountaineer, mt. arayat, mt. banahaw, mt. 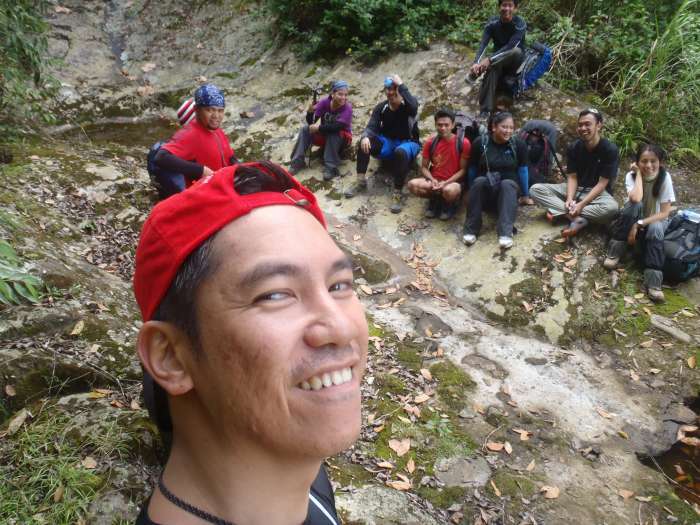 makiling, sacred mountain, tatlong tangke, vac, voyagers adventure club. Bookmark the permalink.